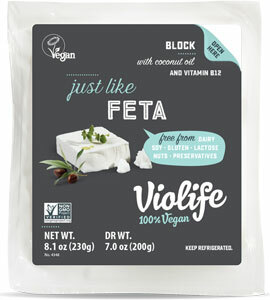 Violife looked to their Greek heritage for inspiration with their awesomely amazing Just Like Feta, and they came up with the best vegan alternative you can find! Perfect when tossed in a salad, when served with olives or cherry tomatoes, or melted into a portobello mushroom for a tasty meal or appetizer, Just Like Feta will replace the "real thing" in all your favorite meals and appetizers, giving you a way to enjoy the classic Greek cheese flavor and texture without the dairy. 7 oz. (200g) blocks of Just Like Feta are $5.19 each. It really has a goat cheese taste! From Lindsey Giddings of Richmond, Virginia on 4/1/2019 . Just like goat cheese feta! From Anonymous of new york, New York on 3/20/2019 . There are very few things I miss and could not replace when it came to being vegan and one of them was feta cheese. This blew my mind. The only downside is it seemed to go bad a bit quickly, but that is also somewhat my fault as I was trying to savor it and not devour the package upon opening it. From Anonymous of Coatesville, Pennsylvania on 3/8/2019 . I was looking forward to trying this because feta was one of my favorite dairy cheeses. It's not that the one is bad necessarily, it just reminds me too much of the texture and flavor of dairy goat cheese, which I have always been turned off by. It became palatable when I added chopped Roma tomatoes, sliced red onion, sliced cucumber, Italian herbs, cider vinegar, lemon juice, Olive oil, garlic, salt and pepper. The texture is good for spreading on toast or crackers though. From Amy Patel of Safety Harbor, Florida on 2/1/2019 . I was really impressed with this. I’m Middle Eastern and ate a lot of Feta in my life before going vegan. There are many types of Feta, and this resembles the creamier version. True, it is not like the crumble stuff you find in your normal grocery store but that stuff isn’t really traditional Feta either. The tang is there and I think it’s very tasty. It reminds me a bit of goat cheese also which I used to love as well. From Anonymous of Henderson, Nevada on 1/19/2019 . I'm Eastern European and I know what authentic feta tastes like (which is nothing like the American versions). Let me tell you, this is exactly like the real/dead animal version (I don't like to call it "fake" food), but with a slight hint of coconut at the end. This works best in salads and paired with olives, you can't taste the coconut. I've baked it in spanakopita and it melts and practically disappears, so I recommend to just use tofu that has been marinated to taste like feta in baked foods. I've been searching for vegan feta for years and am highly impressed!